He Yuming (Huang Xiaoming) is a hard-working car salesman; all he dreams of is to propose to the love of his life, Yan Yan (Sarah Li) who is supposed to come back from the US soon. However all of sudden, she breaks up with him on the phone. To fly to Los Angeles and win back Yan Yan, Xiaoming joins a “Hollywood Adventures” tourist group and unwillingly joins forces with fellow traveler Fang Dawei (Tong Dawei), who sees life through the lens of the movies, and reluctant travel guide, Wei Wei (Zhao Wei), a beautiful woman who is everything Xiaoming is not. The trio then goes on an epic cross-cultural adventure where anything is possible in Hollywood. I caught this film without watching the trailer, so it was really just for the cast: Huang Xiaoming, Zhao Wei and Tong Dawei as I’ve been watching several films of theirs for the past one year. They were mostly emotionals ones like The White Haired Witch of the Lunar Kingdom and Dearest. It was nice to see something funny for a change. Just “like a film that’s started shooting before the script’s finished”, you don’t really get to anticipate what happens next and everything is so ridiculous and unbelievable, because everything’s possible and “nothing’s impossible in Hollywood”. Like many Chinese comedies, several characters are named after the actors’ names, such as Huang Xiaoming, Zhao Wei, Tong Dawei, Rick Fox and Kat Dennings. And if you having been watching Hollywood films, you will find many familiar Hollywood actors acting as supporting actors and cameos (more than 13 of them!) in this Chinese-language dominant film. Aside the Missi Pyle (Remember the sidekick girlfriend in Home Alone 4? ), the appearance of Fast and Furious actor Sung Kang as Manny, the antagonist is perhaps the next most surprising moments. I never thought it was such a HUGE production! Parodies and imitation of classic characters (think The Terminator, Red, and The Hangover) might bring you some laughters, only if you’ve watched those films before and recognise those characters. Watching Vicki Zhao spout strings of English, do a Charlie Angels by throwing punches and marksman’s gunshoot as well as saying the F-word in this film might well be the very reason why you should watch the film. Ok, also if you want to watch her kiss her childhood best friend Huang Xiaoming too. There were plenty of cliche moments, but I have to say the over-the-top car action sequence (which reminds one of Fast & Furious) might just be the very moment you find your money worth (although I did spout out “Crazy!” when I saw the scene). Tong Da Wei, the silly and dreamy comedian will be the one who gave the most unexpected results and diverse appearances. From a gay-lookalike to martial expert, from an odd Hollywood film fan (or Kat Dennings’ fan) to an actor wannabe to a stuntman hero in the final showdown, all the impossibles have took place on him. While I was pretty disappointed with the unfocused plot, I had to give credit to the film for the cast, the attempt for a Chinese-Hollywood film, and as well as the three A-star Chinese actors for their odd chemistry. At the very least, I will rather imagine myself having this absurd Hollywood adventure as compared to a crude-talking bear for boyfriend. ‘Hollywood Adventures’ is the largest Chinese-language movie to film in Southern California. A crew of 75 people and 55 production vehicles were used to stage a gun battle scene for the movie. This is Justin Lin’s, the Taiwan-born director of Fast & Furious instalments 3-6, first Chinese Language film debut. During the filming of the van driving in the desert, Freerange (the pig) defecated during a long take. Zhao Wei and Huang Xiaoming completed the scene before alerting the director. Zhao Wei and Huang Xiaoming had known each other since school days in Beijing Film Academy. This is their first collaboration and their first film with kiss scenes. Huang Xiaoming revealed in the past it was his dream to kiss her. 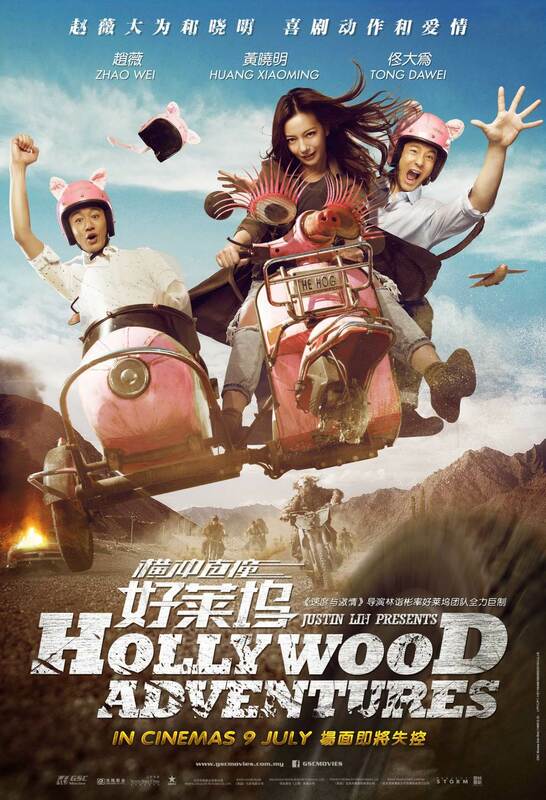 Hollywood Adventures (横冲直撞好莱坞) is out in cinemas on 9 July 2015. This looks like a movie I would enjoy! I hope I can get a copy. Would love to catch this movie, for the cast that is! Always find the friendship between Huang xiaoming and Vicki Zhao intriguing. Would love the watch this especially that Han (hehe, I mean Sung Kang) is there. It’s good they have subtitles and the plot seems to be a very entertaining. I think I will not like this kind of a movie, as I have seen your verdict rating its only 3.5. So there is a problem with the story I think…and also how the actors and actresses do their characters will also matters. I’m getting a lot of Asian movie recos from you, thanks so much! The plot is interesting and seems hilarious too. It would be a good break from the usual emotional and heavy drama films that are being shown lately. I hope to be able to watch this one. The actress looks familiar to me. I wonder how the movie rated in US cinema. Any idea? I like Zhao Wei, looks like she lost a lot of weight. I prefer her in the princess series than the modern movie. This movie storyline is kind of expected so I might give it a miss. Seems a nice film to see because the plot seems a mix of comedy and drama. It’s anything goes for this movie. It’s a nice concept that it has a lot of surprises and is not predictable. It definitely looks interesting for a Chinese language hollywood movie. I’m really curious as to how they managed to pull it off, and in a very comedic fashion too! I like watching a good comedy with a touch of dram and a little romance. I hope I can find this. This movie looks like a mix of drama, romance, comedy and action. Overall seems a good movie though not familiar with the star cast. I think Ive seen the actress from other movie, I just cant remember what film was it? Seems to be a film about assassins. Was it the Closer? ?